As with your carpets, upholstery can be one of the biggest purchases you will make for your home and no matter what type of upholstery you choose, at some point in its eventful life, it will require cleaning. The majority of Fabrics can be wet cleaned to give excellent results. But as with carpets, each different type of fabric requires specialist knowledge as to how it best be cleaned. 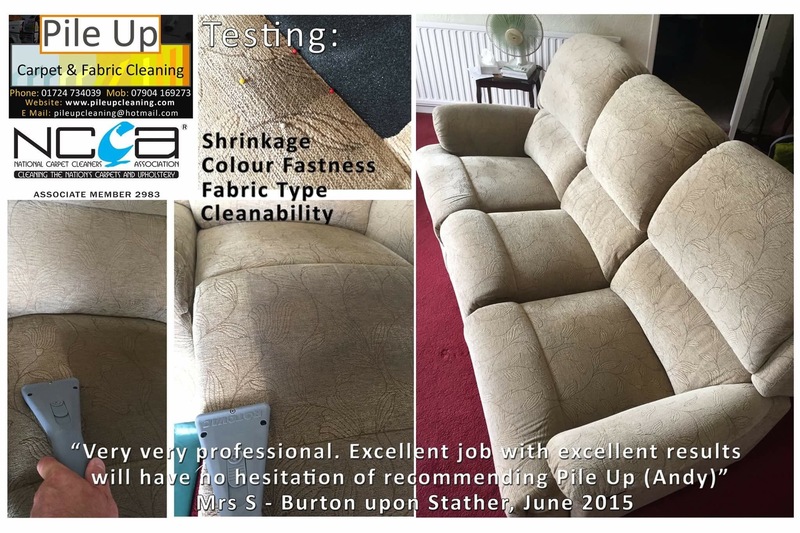 A free evaluation of your upholstery’s needs: I will always identify the fabric and clean it in the safest way to gain the best results. I tell you the best approach and why. Each manufacturer recommends a specialised cleaning method. Best of all, you will know up front what I can and can’t do, so there are no surprises! Even if you don’t choose ‘Pile Up’, make sure you get a quote which details the different fabric treatments required. If the wrong cleaning agents are used, they will ruin the fibres and possibly the entire furniture. How long will it take to dry? Most Fabrics will dry in 3 to 4 hours, some in as little as 1 hour. Can my Sofa be cleaned in my home? Yes I will clean your Soft furnishings in situ. Will you wet the flooring under the Sofa? No, I use a very sophisticated cleaning hand tool which contains the moisture.